Bizarre Creations, the development team behind the renowned Project Gotham Racing series, used to make games for Microsoft. Now, they make games for Activision. Why the split? 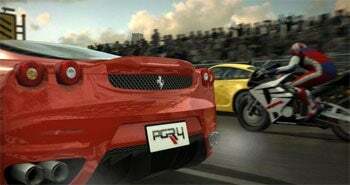 Speaking with Edge, the studio's creative director Martyn Chudley has told of Bizarre's final weeks with Microsoft, as development on Project Gotham Racing 4 (which I maintain is the best racing game of this generation) was being wound up. I'm not going to slag [Microsoft] off in an evil way, but obviously we worked on PGR4 for them, and I think that PGR4 was the strongest Gotham game we did – the most fully rounded. But towards the end of that project they wanted us to bring it in early, to chop six weeks off development. But the way we work is really right up to the wire, so basically the game is nowhere near finished at six weeks to go, so we had to dig our heels in and say that our contract said that we're to bring the game in on this day, and that's what we were going to do because we cannot compromise the work that the lads have been doing, and the quality of the game. They didn't realise how bad a situation it would have been – we needed that extra six weeks, and it got us concerned with the future with Microsoft… We were getting disillusioned with Microsoft and they were getting corporate and cocky as well because of the shift in power between them and Sony. Perfectly understandable, and stupid of Microsoft to let one of their better studios get away like that. But, uh, why the deal with Activision, of all people? How can the publisher that makes exploitation of a franchise a core business aim be any better?